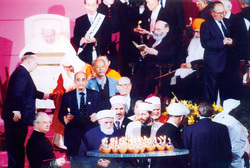 In the aftermath of the September 11 terrorist attacks in New York City, Pope John Paul II invited the Permanent Committee of Al-Azhar for Dialogue - along with more than 40 delegations representing a dozen religions - to pray for peace on January 24, 2002 in Assisi, Italy and solemnly repudiate any form of violence carried out in the name of God. Dr. Aly Elsamman, President of ADIC, Advisor to Grand Imam Mohamed Tantawy, and Vice President of Permanent Committee of Al-Azhar for Dialogue with Monotheistic Religions was sent by Grand Imam Mohamed Tantawy to delivering the following message to the delegations present at Pope John Paul II’s Prayer for Peace in Asissi. In the name of God, the Most Merciful, the Most Benevolent. I wish to thank his Holiness Pope John Paul II who today has gathered the representatives of the different religious traditions, all moved by the same ardor to build a better world. Muslim belief gives us indications to enlighten us on our journey towards peace, which I will very briefly present to you. God revealed monotheistic religion for humanity’s happiness. Religions preach all the values of peace and prosperity, as well as the exchange of all the beneficial deeds authorized by God, cooperation among all peoples fostering voluntary service and piety, not offense. Fourth, all the monotheistic religions preach that the humans being should support law and justice, restoring the legitimate proprietors to their rights. On this occasion Al-Azhar Al-Sharif has the pleasure of paying tribute to the Vatican for its honorable support of the Palestinian people. Al-Azhar and its ulemas, in this day of prayer, join themselves with conviction to the call for immediate peace, inseparably bound to justice.